Last Saturday I ventured south, “over the hill” as we say locally, from Strathspey to Aboyne in Deeside for the Hilltrek Event (see post for Oct 24).. Chatting to customers was a pleasant way to spend the day and I enjoyed myself. As a writer I spend a great deal of time alone at the keyboard. Meeting other outdoor folk is always welcome. One of those was Aktoman, who has already blogged about our meeting, with whom I had a long and interesting conversation. I also enjoyed meeting the Hilltrek people and seeing their store and workshop. 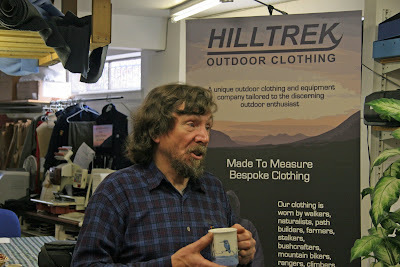 Hilltrek makes some good looking clothing – and when I say make I mean make, right there on the premises. You can see some sewing machines behind me. Hilltrek uses top fabrics, including Karisma, in my view one of the best fleece fabrics but now mostly abandoned by bigger manufacturers for less functional but more fashionable fabrics. Karisma (which some readers will probably know under its Mountain Equipment name of Ultrafleece) is a very hard wearing fleece that is more wind resistant than standard fleece but still very breathable, unlike windproof fleece. Reminded of it by my visit to Hilltrek I dug out an old pair of Karisma trousers and wore them today for a walk in the dusk on a cold breezy day. They felt great. It’s good to see someone still making garments with Karisma. Hilltrek also makes garments from Ventile, including a useful looking single skin windshirt, Symapatex, Pertex and Nikwax Analogy, as well as being a major stockist of Paramo clothing. Hilltrek offers a made to measure service, which looks great for those of us who aren’t standard sizes (trousers are nearly always too long for me). The picture was taken by Dave Shand of Hilltrek. John Manning, a good friend of mine, was for many years the Deputy Editor (“Deputy Dawg”) at TGO magazine, as many readers will know. As equipment editor for TGO I worked with John on many gear features and we visited quite a few trade shows together, including one in Manchester where we stayed in a very strange hotel! We also had many good trips in the outdoors - and hopefully have many more to come. Now John has taken a deep breath and jumped from the security of a 9-5 job to the randomness of freelancing, where you can twiddle your fingers one day and work 24 hours the next. He’s also moving from the busy streets of Glasgow to the quiet lanes of the Yorkshire Dales – though he’ll still have a pub within a few yards. As part of his new freedom John has a website, Outdoors Manning, that looks entertaining and informative. 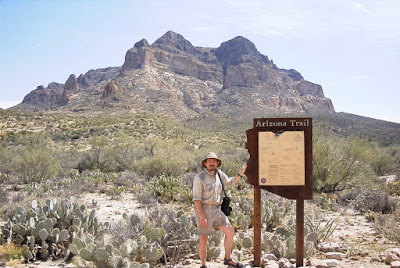 John’s an experienced backpacker, a stalwart of the TGO Challenge and a Pacific Crest Trail thru’ hiker in 2004 – 22 years after my thru’ hike, which led to some interesting discussions on the changes in that time – and has many tales that should ensure his website is of interest for years to come. 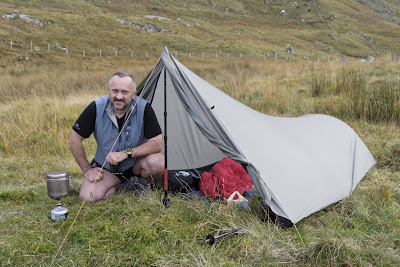 The photo shows John at a wild camp during a backpacking trip in the Moidart region of the Scottish Highlands. Photo info: Canon EOS 350D, 18-55mm lens @ 30mm, f5.6@1/100, ISO 200, raw file converted to JPEG and processed in DxO Optics Pro. This Saturday, October 27th, I’ll be at Hilltrek in Aboyne on Deeside to talk about gear, hillwalking, backpacking and anything else anyone is interested in. I’ll also be signing copies of my books. Hilltrek is a specialist outdoor clothing company who make their own products from Ventile, Nikwax Analogy, Pertex and other fabrics as well as selling products from companies such as Paramo (which I'm wearing in the photo)and GoLite (whose Odyssey pack I'm carrying in the photo). If you’re in the area do pop in for a chat. I should be there from 11am until 3pm. The photo was taken at Smokejumper Hot Springs in Yellowstone National Park last February on a cold, misty day. 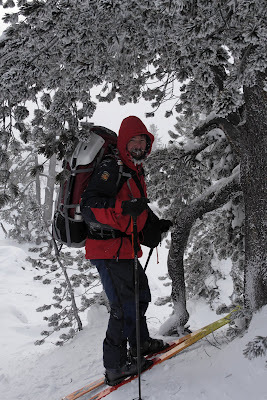 Ed Huesers took the picture with my camera as I sheltered under a beautifully frosted tree. Photo info: Canon EOS 350D, 18-55mm lens@28mm, f8@1/200, ISO 200, raw file converted to JPEG and processed in DxO Optics Pro. As the year heads towards the greyness of winter there’s a final burst of colour as leaves turn yellow and red. In the Scottish Highlands October is the most colourful month, at least in those areas with much deciduous woodland, like Strathspey in the Cairngorms, where I live. Dominant in these spectacular displays is birch and great swathes of golden trees can be seen throughout the strath, dotted here and there with the reds of rowan and gean (wild cherry) and the paler yellow of aspen. The needles of larch, an introduced species, turn a brilliant yellow too, enlivening the plantations where it is found. During September the first changes start to occur but it’s in October that the full glory is usually revealed. Some years the colours are extremely bright, an unsubtle riot of poster paint tints. Other years the colours are more subdued, but also richer and deeper. Dry warm summers and cold autumn nights produce the most dazzling displays, wet summers and warm autumns the darker tones. This has been one of the latter years. Walking in the local woods yesterday I found the colours gorgeous but restrained, the gold of the birches darker than in some years, the reds of the rowans tending to russet. Some trees, especially aspen, are still mainly green, others have already lost most of their leaves. There is more to come as long as the wind holds off. Most years the display lasts for several weeks, until the first big autumn storms strip the leaves and scatter them. The photo shows autumn woodland in Strathspey, photographed on October 7 this year. Photo info: Canon EOS 350D, 18-55mm lens @ 55mm, f8 @1/125, ISO 200, raw file converted to aJPEG, processed and cropped in Photoshop Elements 5.